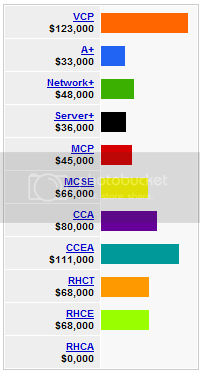 The VCP (VMware Certified Professional) certification I have blogged about twice before has gone through the roof. I have never seen a jump like this in all my years in IT. See for yourself. On an interesting note, the graph is from a new feature on their site for bloggers, although WordPress doesn’t like the display, so I still did my usual upload-a-screencap-to-photobucket, but tried to respect Indeed.com’s format. What do I think about this data? I’m betting on lots of people with advanced degrees, lots of experience, and/or other high-end certs having added the VCP to their career-building portfolio, as well as more top-level management and executives. Also of note is the missing Red Hat Certified Architect numbers. The VCP trend does not seem to have continued across the pond, where the prevailing charts seem to show a continuous value for the VCP. The lesson here is watch the figures, but don’t be surprised when wild, near-impossible salaries turn out to be a case of too-good-to-be-true. I guess it all depends on where you live as obtaining the VCP certification had no effect on my salary level and I'm making nowhere near $123,000. Well I'm a bargin at $100K then!? VMware consulting here I come (with 10 years of IT stuff thrown in the mix of course).